If you are a marketer who wish to connect with people associated with the consulting services industry, Blue Mail Media’s Consulting Services Industry Executives List can help you gain better access to your target market and explore new business opportunities. Our list has been designed to help you reach out to your target customers via multi-marketing channels such as telephone, email or mail. The consulting services Industry is highly diverse, and a strong database of Consultants can help you gain a high response rate, greater conversions and eventually a higher ROI. 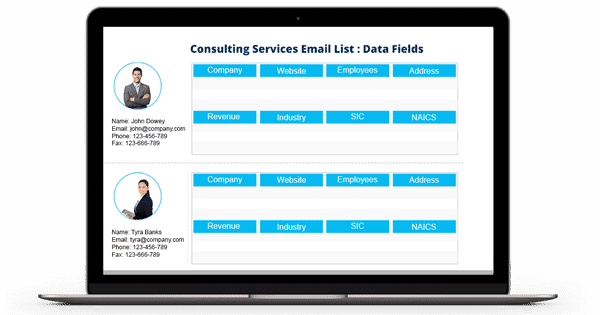 Also, our Consulting Services Industry Executives Email Database removes unnecessary gateways in the flow of communication and saves significant time and resources for marketers to get in touch with their most worthy prospects. Blue Mail Media’s adept team of data specialists follows a well-defined data collection, verification, and update process to ensure high accuracy of our database. Our customers can avail our pre-packaged Consultants Email Marketing List or get their list customized based on their marketing objectives.